My newest book, You’re Worth It! Change The Way You Feel About Yourself By Discovering How Jesus Feels About You, is now available for pre-order. “I don’t know why this book ended up in your hands, but God does. He knows the ways he wants to change your life and the plans he has for your happiness in this life and the next. He has big dreams for you. 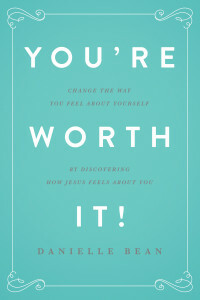 If you or someone you know of could benefit from learning about Jesus’ unchanging and unconditional love for them in a deeply personal way, consider ordering a copy of You’re Worth It! today. Thank yor for your new book, Danielle. I am going through a difficult time at the moment and am feeling very rejected, but having started reading your book I am already a little more uplifted. It will take much more time, but I am hoping for better days. do you lead retreats or have a retreat guide: one day or overnight?